The M245 Deluxe Studio Grand is ideal for the marimba student who requires rosewood bars for performance. 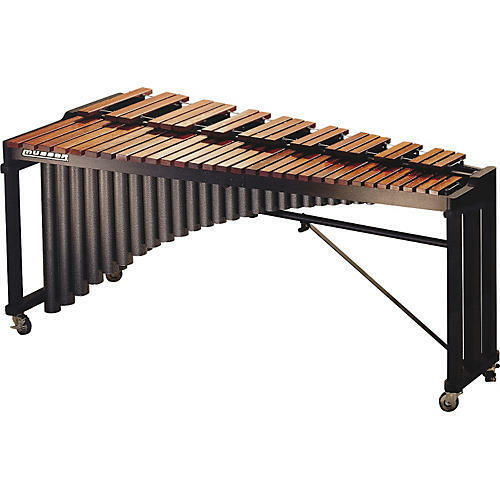 With a note range of A2 to C7, this 4.3-octave marimba is pitched to A-442. The resonators are made of high-grade light aluminum tubing, with silver vein powder coating for scratch-resistant durability. The frame is made of wood and securely braced for stability. For ease in transportation, the frame and resonators are hinged to fold in half. The Concert Grand is a classic marimba that has become a favorite of symphonies and universities. Rosewood bars are triple-tuned and suspended to assure distortion-free performance. Arched resonators are drawn seamless aluminum and finished with a gold powder coat, for a rich look and sound.